A solo exhibition of artworks by Ben Coutouvidis was hosted from 27 May to 19 June 2010. ‘Play’ is the general theme in the collection of works constituting this exhibition, and it also describes the ethos with which this show has been curated. This series of work is an affirmation of the seriousness of play as a pursuit and as a prerequisite for artistic production - the space one creates between what one is and knows, and what one can become and the unknown. The fragility of developing normally, of which play is an aspect, is commented on in the two paintings of the same young girl. The repetition is an attempt to create a dream like sense of deja vu; suggesting that she represents an aspect of one’s own psyche. In the still life of the Ostrich egg and quince, the egg represents the potential for perfection, while the green quince has been stung and will rot. Similarly the painting of the cat on the windowsill illustrates how it has become stained by its environment. The paintings of water are intended to be simply poetic – communicating the natural rhythm and harmony in nature. 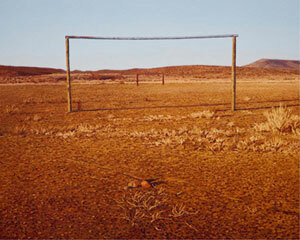 The paintings of the goal posts represent ‘places of play’ in the Karoo, one of them being a farm school pitch. Along with the tennis court in the internal courtyard of the Robben Island prison, these are humble spaces devoid of glamour that still offer the potential for play, joy and transcendence. ‘Memory’ is a sub-theme in this collection of work. One of the salient qualities of working with wire is that one imparts a memory to it by bending and shaping it. The juxtaposition of the linear characteristics of irrevocable historical time, against the cyclical characteristics of resurrective ritual time, is captured in the wire circles as appropriate metaphors for memory. I wanted to use words in one of the sculptures to indicate language as a form of memory-capturing sieve. Having recently read the book Scorched Earth, about the concentration camps in the Anglo-Boer War, I chose to use the names of those camps – mostly towns along the major railway lines. The wire sculpture that looks like a spider’s web, serves as a visual metaphor of how memory is an active attempt to capture or apprehend. In Scorched Earth, the incredibly harsh conditions of the camps forced people to make basic utilitarian objects by whatever means possible, such as baskets or containers made from wire, which have the same structure as a web, only concave. Their eyes revolve the whole town like a blue and green ball. Nobody dies or is born without their knowing it. They talk of bride-lace, of lovers spunky as gamecocks. Twist old words into the web-threads”. So the net becomes a metaphor for how memory is woven into craft and oral tradition, and hereby creates community. The wire plant sculptures were inspired by drawings done by San children, sourced from the Bleek Collection. The poignancy of these works lies in the children’s attempts to invoke a landscape from which they have become exiles. “My memory is like a sieve” was the inspiration for the perforated paper work. The piece of paper acts like a sieve, with the tiny holes alluding to pixelation and memory in a digital sense. My ‘written landscape’ is also about sieves and memory; it is an attempt to superimpose different sieves in order to capture enough “stuff” to reconstitute the land as an image. The drawing utilises different accounts by different people traveling through the South African landscape, including Deneys Reitz’s On Commando, which was his account of his experiences in the Anglo-Boer war, and Adulphe Delegorgue’s travels as a natural historian/scientist. Each writer tried to name the landscape in a different way. The particular passage that I used from On Commando tells of an incident that happened near Prince Albert when the Boer commando, traveling at night on horseback, rode into an on-coming British mounted column. In the darkness and confusion, “no-one said a word”, as their language would identify them and could mean being shot at. This is a wonderful synecdoche for that war, when what was at stake was the right to define one-self on one’s own terms. I hope you enjoy this exhibition.